A new study found that heat makes soil liberate dioxide carbon, dioxide carbon worsens greenhouse effect, and greenhouse effect generates more heat. It’s all cyclic. In 1991, a group of researchers decided to excavate lands from a Massachusetts forest owned by Harvard University. They buried electricity cables to warm the ground and see how the heat affected the soil. Then, they just increased 9 degrees Fahrenheit (5 degrees Celsius) above the average temperature the soil is daily. The results were impressive, they said. Twenty-six years later, researchers found that the first 60 centimeters of the organic matter had lost a considerable amount of stored-carbon. Thus, contributing to the damage global warming is inflicting upon Earth. In a paper published Friday in the journal Science, the leaders of the investigation said that around 17 percent of carbon liberated from the soil due to the heating. Harvard scientists suggest that ordinary soil loses enormous amounts of carbon when it receives hot temperatures. This worsens climate change and accumulates more carbon dioxide, which winds up joining the rest of the gases that humans already produce on a day-to-day basis. Ultimately, this generates a massive carbon dioxide-mass trapped on our planet, not letting the sun rays escape and creating more heat. There are 3,500 billion tons of carbon contained in the world’s soil, which stay stored in organic matter. According to U.S. Marine Biological Research Laboratory scientist, Jerry Melillo, bacteria live inside the ground and feed on the matter, which releases carbon dioxide as a byproduct. At a natural heat, bacteria digest matter more quickly in outside lands, thus contributing even more with the carbon dioxide escape. Previous studies had already suggested that heat helps bacteria feed faster, making soil release carbon. However, there was still a long way to walk. Now, scientists do not doubt it: they found that the carbon release is occurring on a considerable scale, even higher than the others researchers expected. The results impressed scientists because they didn’t expect to find anything like that, global warming wasn’t even a “thing” at that moment. 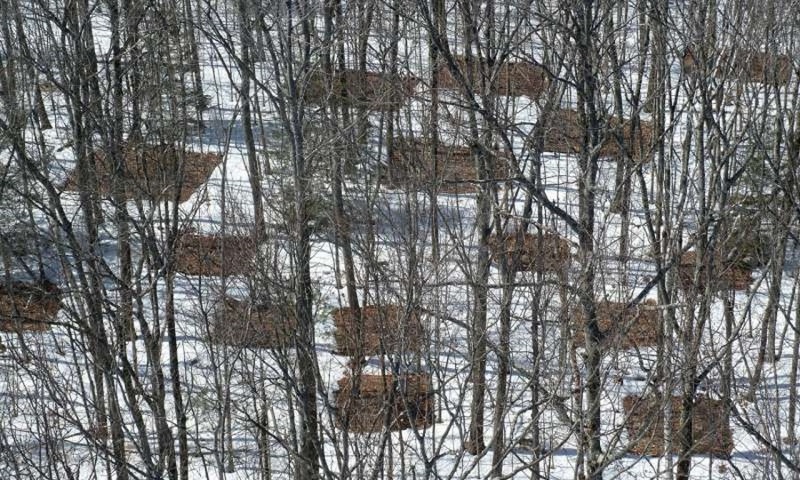 They just wanted to measure how carbon dioxide may escape from Earth as the atmosphere warms, so they proceeded to divide the forest full of black oak trees into 18 equal, well-distributed, 6-to-6 meter squares of soil rich in organic material — precisely what the researchers were looking. They decided to sub-divide the squares into three groups, keeping a patron: the first block was not buried and installed with any heating cable. The next one was full of wires to elevate the temperature by 9 degrees Fahrenheit. The next one was just a control, threaded with cables but never turned on. Carbon dioxide released from soil over this century will be equivalent to the “past two decades of carbon emissions from fossil fuel burning,” which is similar in mass to the amount carbon losses to the atmosphere “due to human-driven land use change” during the past two centuries, the researchers said. Climate change has caused a lot of people to think about how it’s affecting our planet, and what can they change to help it. Just last week, the U.S. government provided at least four high-profile, well-funded papers, to contribute with new evidence, observations, and insight into the role of soil and forests in the global carbon cycle. When talking about climate change, soil never received much of attention before. At least not as much as the atmosphere, or even oceans. In fact, oceans hold 60 times more carbon than the atmosphere and absorb more than 90 percent of the heat that industrial pollution generates. It’s important to remind that making anything to resolve this problem will be very challenging. The ground is not just land or dirt. It is also what humans use to get many things, especially food. From soil, we receive cotton, corn, soybean, wheat, oranges, cattle, and more.